The sooner the better. He has all the arrogance of Mourinho and none of the squad or managerial ability. He has to put his hands up and say he's got it wrong but in his post match interviews he never gives that impression. He's done a better job of replacing his wife than Suarez. So glad Baron Brenda and Fraudpool have been found out. Let's be honest, had Chelsea got a striker, we'd not bottled, or Utd had played properly then they would not even be in the top four. Why do people make statements like this, it's legitimately retarded. He is the kind of person to shift the blame on someone else whenever things go wrong, and the only manager I can honestly say has that right is Garry Monk (or maybe Harry Redknapp). I don't buy his age as an excuse, he just has an abrasive and narcissistic personality, and Suarez covered over the cracks. Suarez was an alright guy who had moments of madness, yet people saw his effort week in, week out, and praised Brendan Rodgers for amazing 'man management'. I remember when people were saying Rodgers was the perfect man for Balotelli because he would 'sort him out'. I think big big questions have to be asked. It's a case of if I'm a Liverpool fan "What are my expectations?". How can it possibly be good enough to have a brilliant season last year, nearly win the Premiership, then spend 116M and finish 7th or 8th? If I was a Liverpool fan I'd be looking for minimum top two again, and a trophy as well. Anything else just isn't ambitious enough. For such a famous club, last season can't be a "one off", it surely has to be "the norm"? It's a small club with a small club mentality. I'm absolutely horrified at my own clubs league position, but Liverpool are a side that were genuinely world class last season, so to be performing as they are, I'd want Rodgers out unless you were top 2 by Christmas. Anything else just isn't ambitious enough. Rodgers man management was good though tbf, it wasn't just Suarez, players like Henderson, Sterling, Coutinho and Sturridge all upped their game last season. The inability to replace Suarez and provide backup to Sturridge as well as the extra CL games hit him hard and he is crumbling under the pressure as a result. Remember that Rodgers had Suarez in his first season and still finished mid table, Kenny had Suarez and still finished mid table, same with Hodgson. It was only until Rodgers signed Coutinho and Sturridge and played a system that suited all the players that the Liverpool team clicked and when HAM last season. That was why Rodgers got a lot of praise because he made the best out of Suarez and the other players that previous managers failed to do. Arsenal and Chelsea finished in the top four anyway, so i'm not sure what you're trying to suggest here. I'd give him till the end of the season at least. Realistically they'd attract nobody better, and he does deserve time. If things still look like this in feb/march, then I'd begin looking for his end of season replacement. It's more important for them to keep Sturridge and Sterling around than to change manager. The only real difference between Liverpool and Spurs is the size of the delusions. I'd give him till the end of the season at least. Realistically they'd attract nobody better, and he does deserve time. 2 and a bit years not enough time for you? *time based on the achievements of last season. If the potatoes had spent wisely they'd have got their ahead of the Scousers. What was I trying to say was that the Mickey Mousers wouldn't have been title challengers or in the top four. Wait - why can't they now? Henderson and Coutinho are still there. They have only lost one striker that they didn't have at the start of last season, hardly a complete shift. Moyes gets slaughtered for signing Fellaini, but look at all the ****e this guy has brought in. Yeah, only Coutinho and Sturridge are genuine successes out of that lot. Horrible ugly little man. Hits the big league and big money so he ditches the Wife for a younger version, loses some weight and gets his teeth done. Tells you everything about him. Rafa would have killed it with that cash. he should have won the league, but then if they finish below top four, he may be given one more season, if not, he's out. And given how football is now with money, I don't think that's unreasonable. This "given him time" thing belonged to a different era. Rafa made some good signings but he didn't half sign some duds as well. Babel, Dossena, Keane, Pennant, Voronin and the hordes of mediocre Spanish players. Not to mention trying to sell Alonso to Arsenal and replace him with Gareth Barry. Good signings? You mean world class signings surely. The positives far outweigh the negatives, especially considering most of the bad ones were free (The Voronins, Jovanovic's, Bolo Zenden (Champions League final tbf), the squad players that Brendan has the cash to spend on now). He has 20 million pound defenders sitting on the bench. Same with the midfielders. Liverpool never had that back in the day. The Liverpool bench during that game. 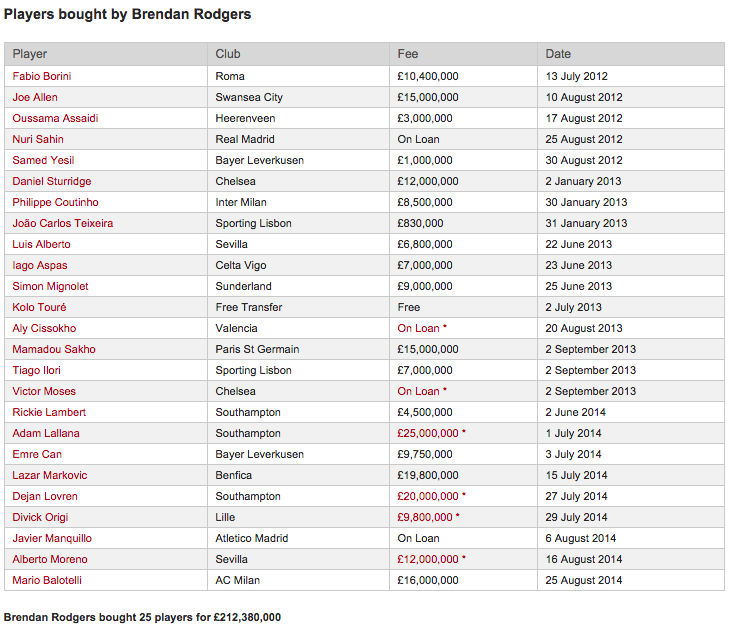 Adam Lallana's tranfers fee far outweighs all of those lot. Not sure if Can's does. Not sure if Markovic's does. Balotelli's is close. You get the picture.